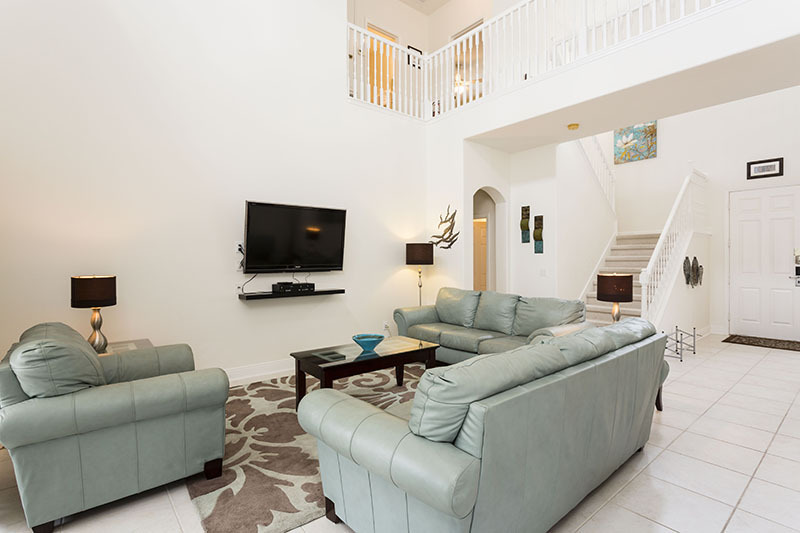 Contemporary Spacious 5 Bedroom Reunion Resort Home Look No Further!A lovely 5 bedroom family home decorated and furnished to a relaxed contemporary theme throughout. 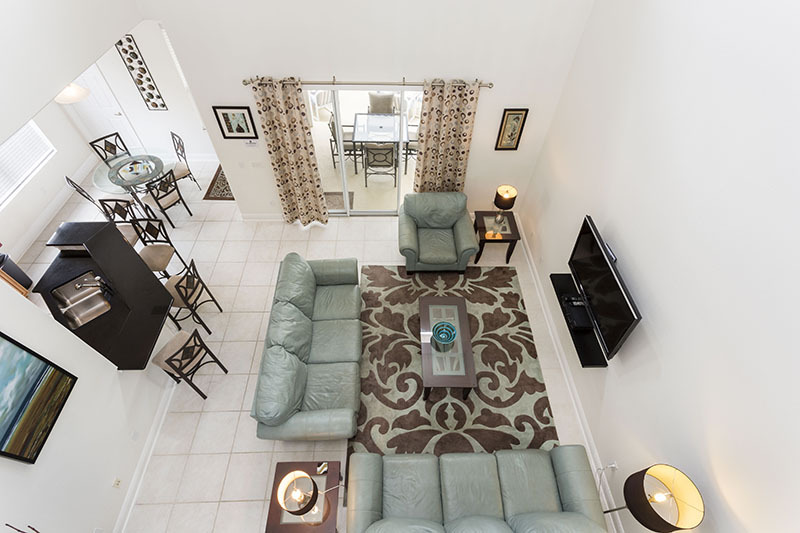 Spacious with a great floor plan that will accommodate a single or multiple families in comfort and ensure a great vacation. 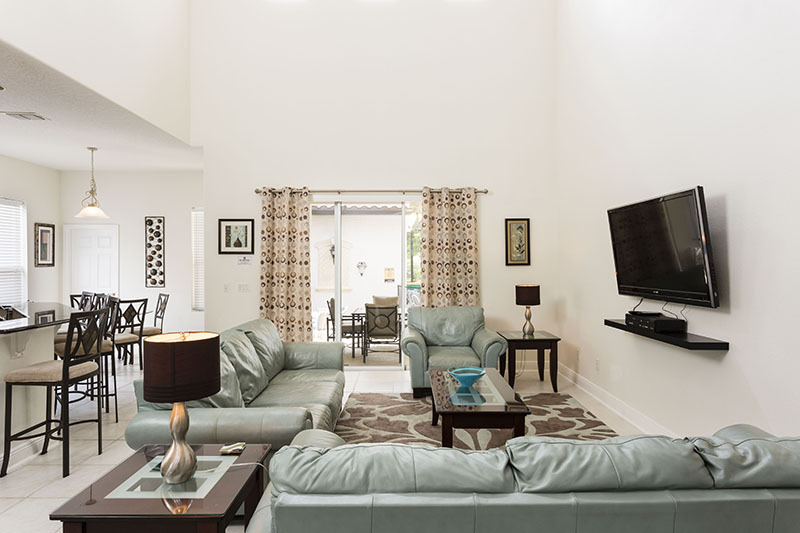 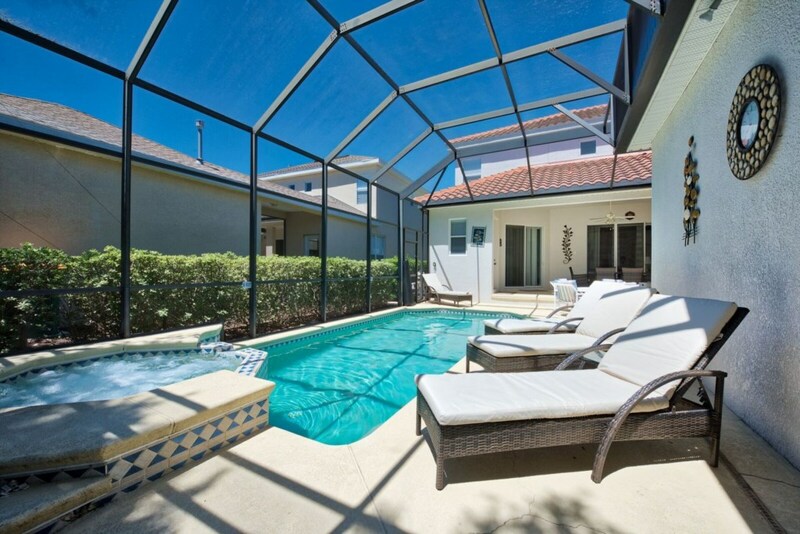 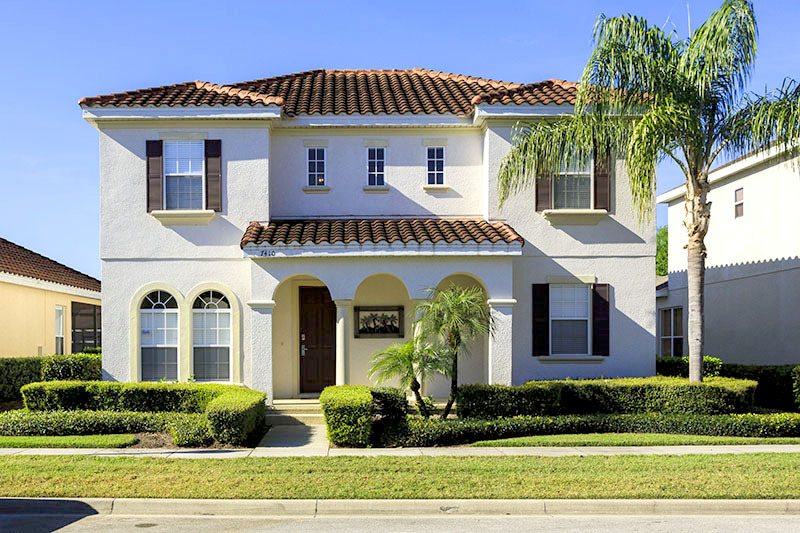 This beautiful home has an enviable central location within the Reunion Resort situated in the Homestead section with most of the resorts amenities within walking distance including the Reunion Grande Hotel, the Golf Club House and Seven Eagles pavilion. 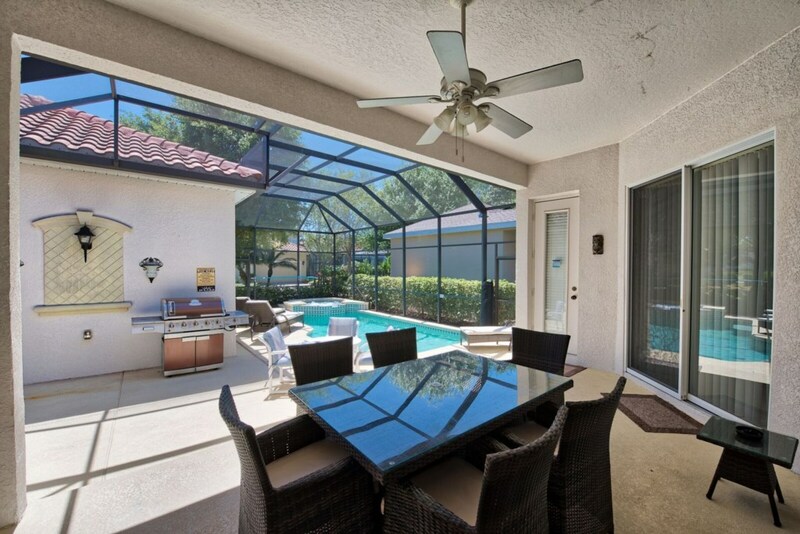 The home is in one of the few locations permitted to have a pool screen keeping the bugs at bay. 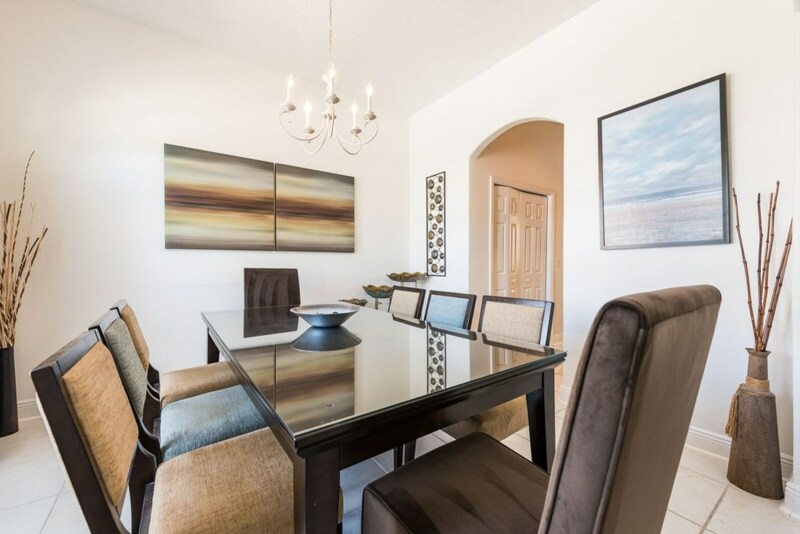 The furnishings throughout have been designed to create an elegant feel whilst still maintaining a relaxing atmosphere where the guests can truly feel at home. 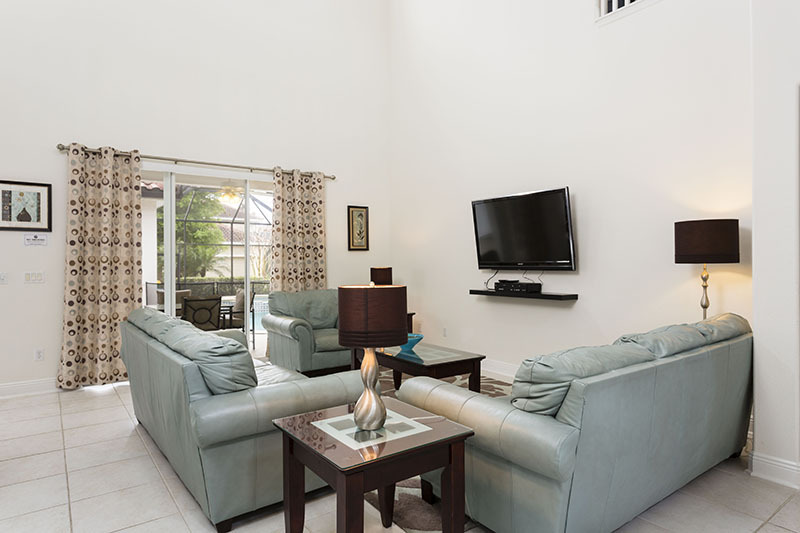 The downstairs living area is open plan with the vaulted ceiling making it spacious and bright with comfortable sofas for enjoying the large flat screen TV, and patio doors offering a lovely view and access onto the pool area. 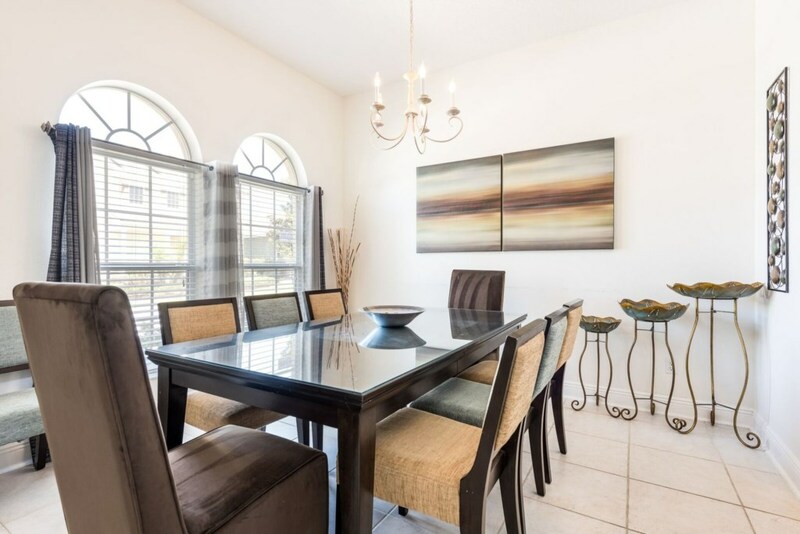 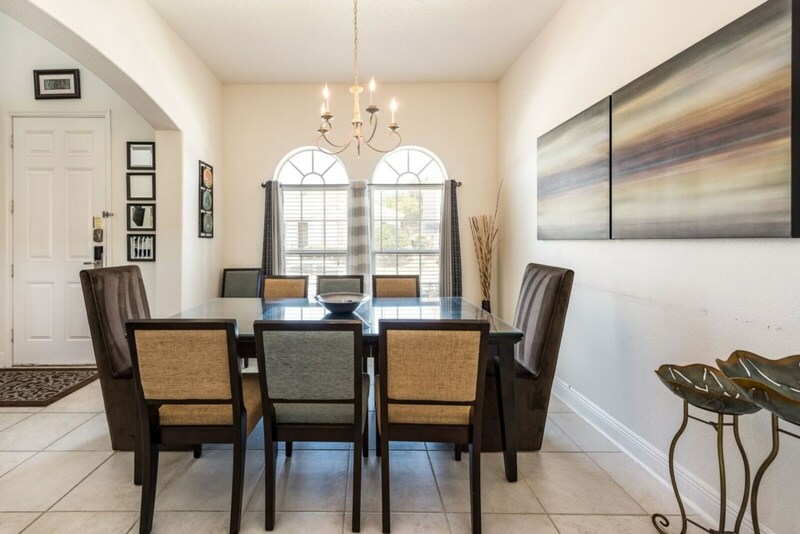 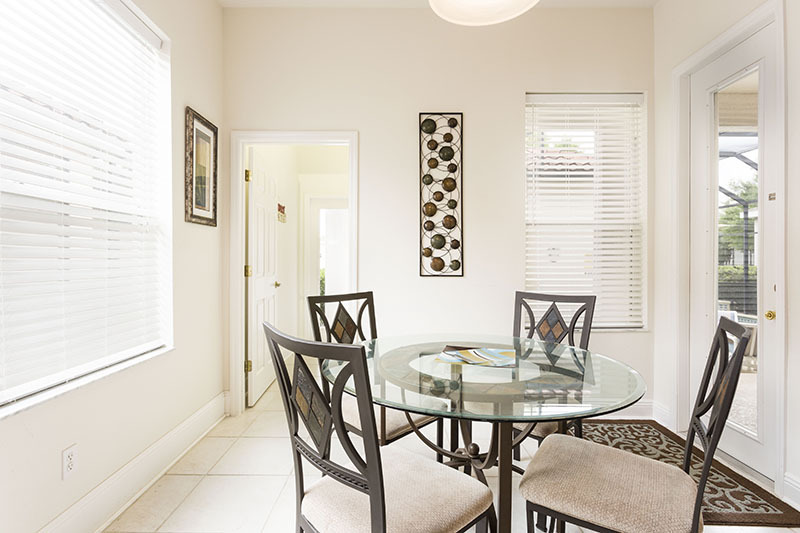 There is a formal dining room seating 6, a family dining nook off the kitchen with seating for 4. 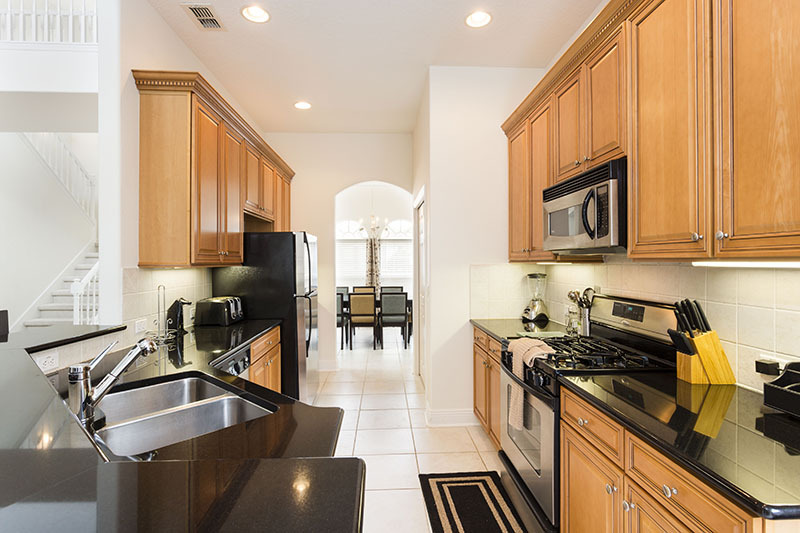 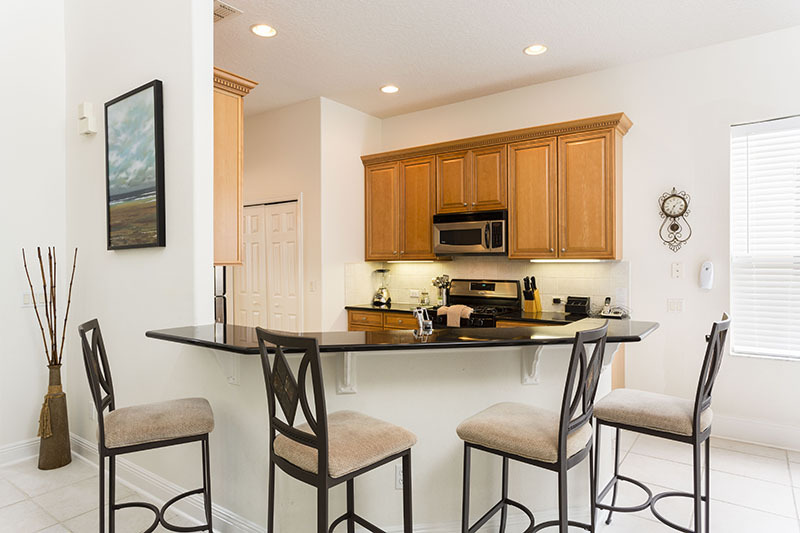 In between the two dining areas is the fully fitted kitchen along with a breakfast bar and high stools. 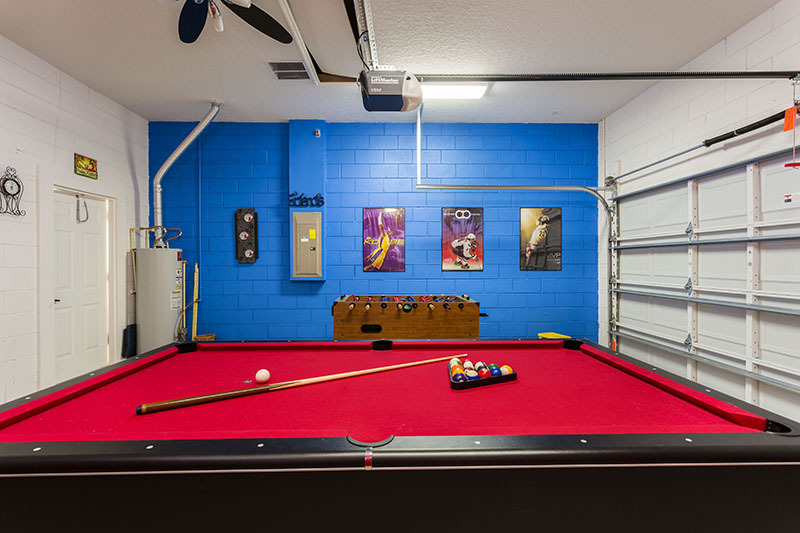 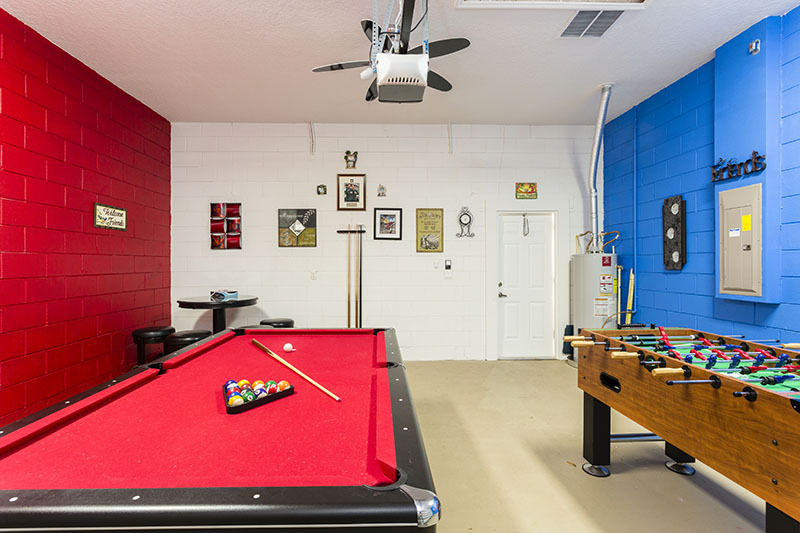 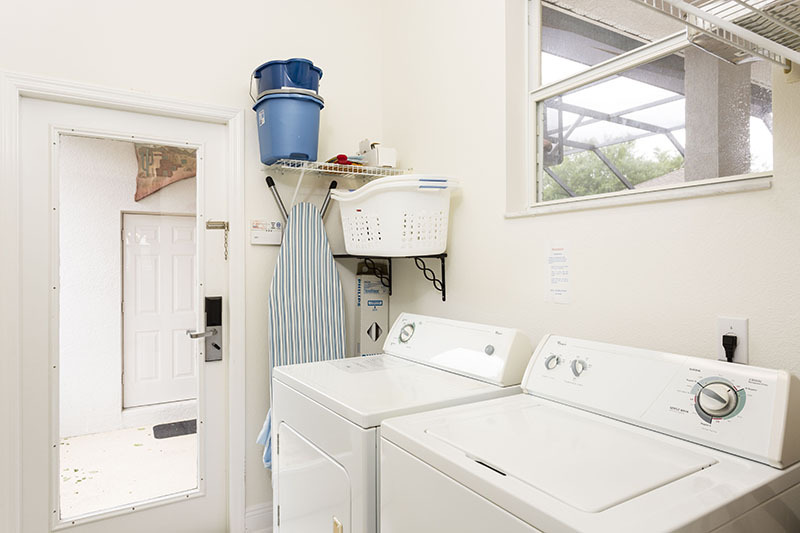 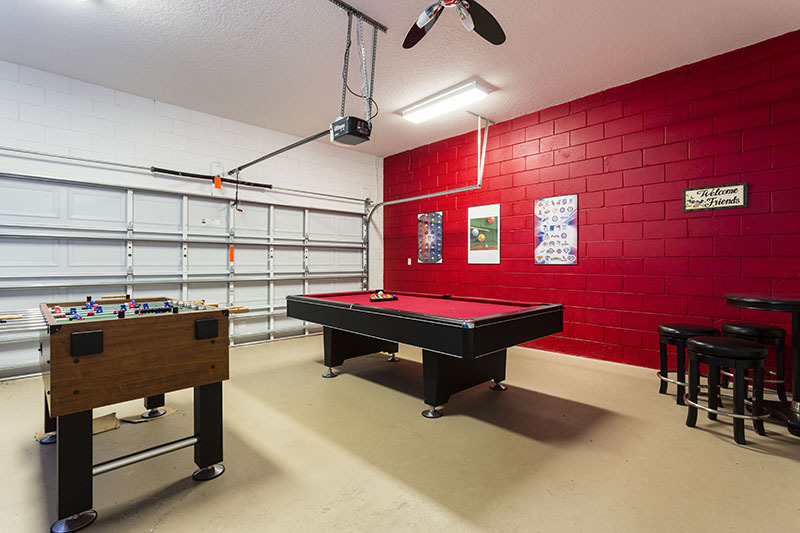 The fully equipped laundry room also offers access to the converted games room which has a pool table, foosball and casual seating guaranteed to provide hours of entertainment for the children. 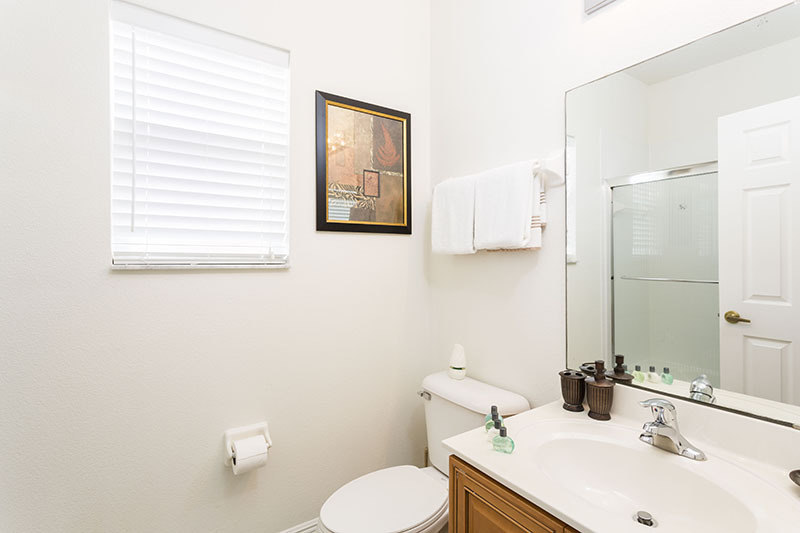 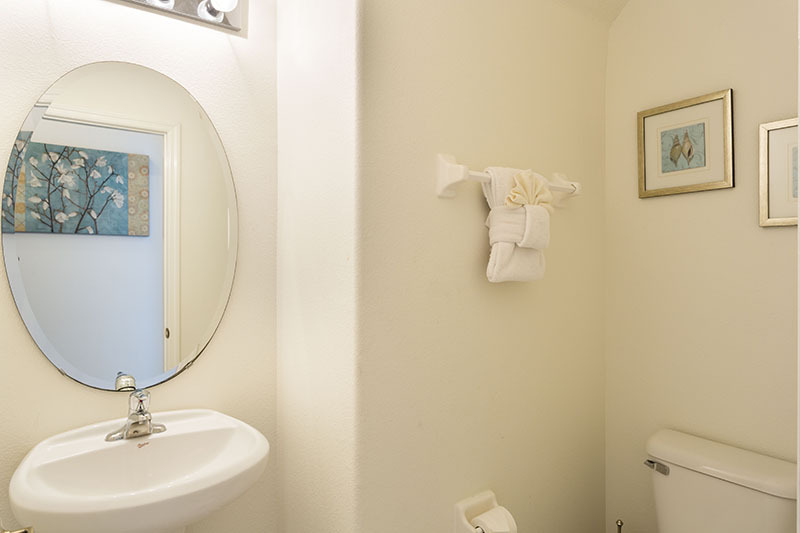 The ground floor also offers a guest powder room for your convenience. 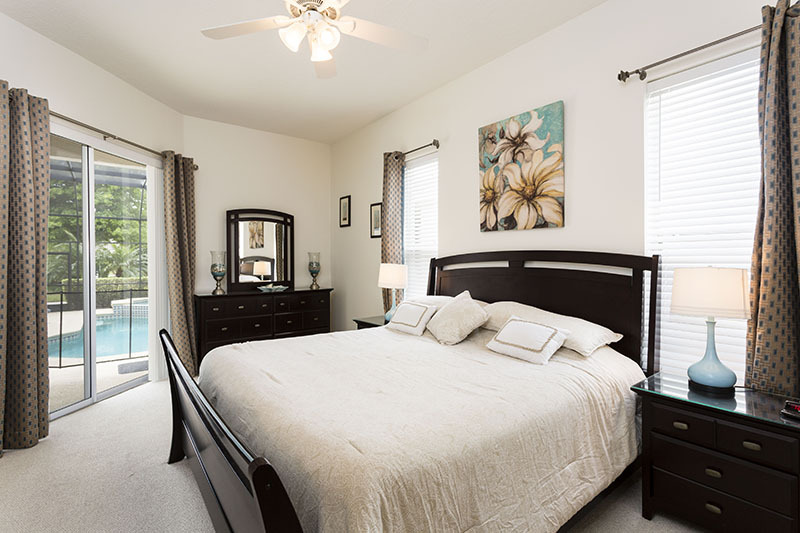 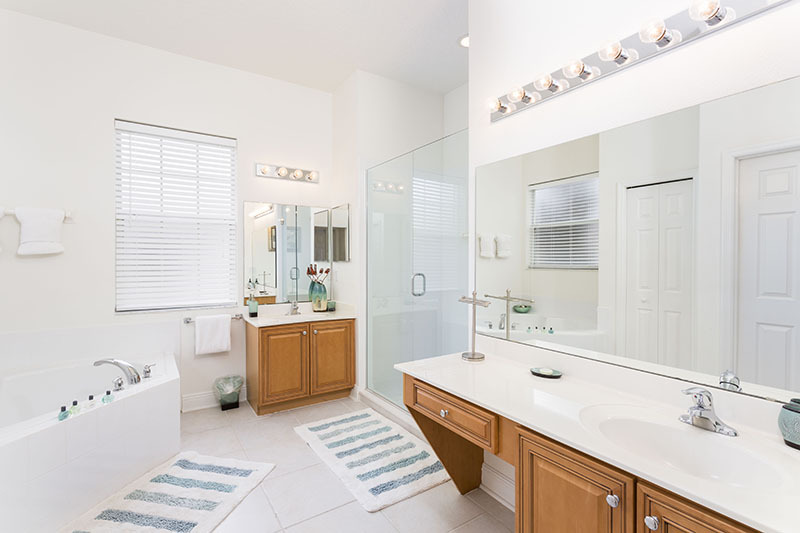 The master king suite is the only bedroom on the ground floor with a large bathroom that has twin vanities, sunken tub and walk in shower, and patio doors lead outside onto the covered lanai. 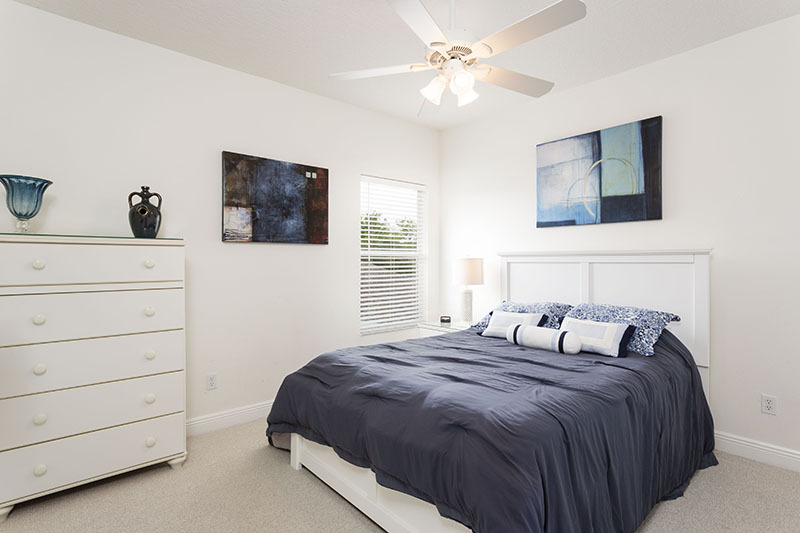 Upstairs on one side of the gallery landing are two bedrooms one having a queen size bed and the other two twin beds sharing a bathroom with tub and shower. 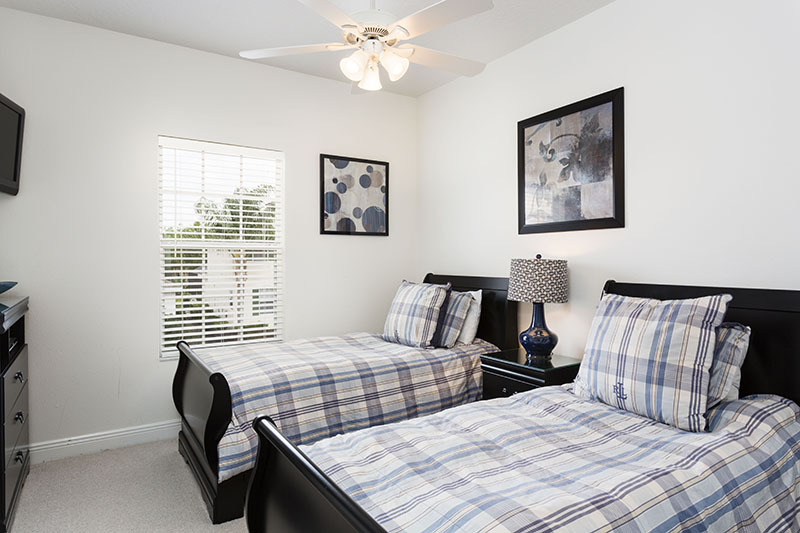 Across the landing are two further bedrooms, again one with a queen size bed and the other two twin beds that share a third bathroom between them with a tub/shower combination. 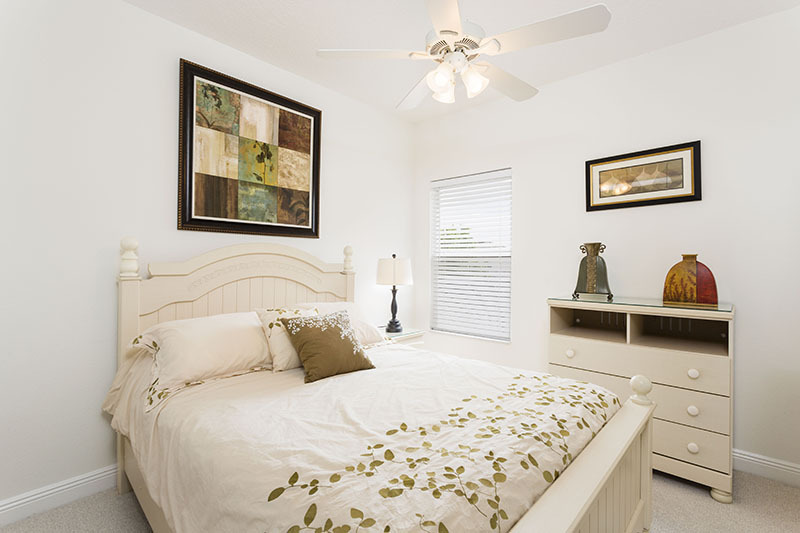 All bedrooms have ceiling fans, TVs and the home has WiFi throughout. 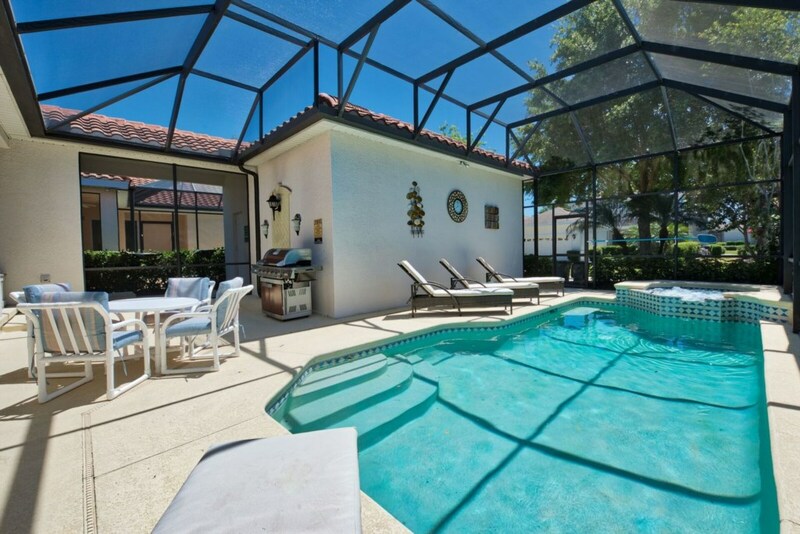 The pool deck has a large covered area perfect for Summer evenings and alfresco dining overlooking the heated pool and spa with lounging space for the sun worshippers. 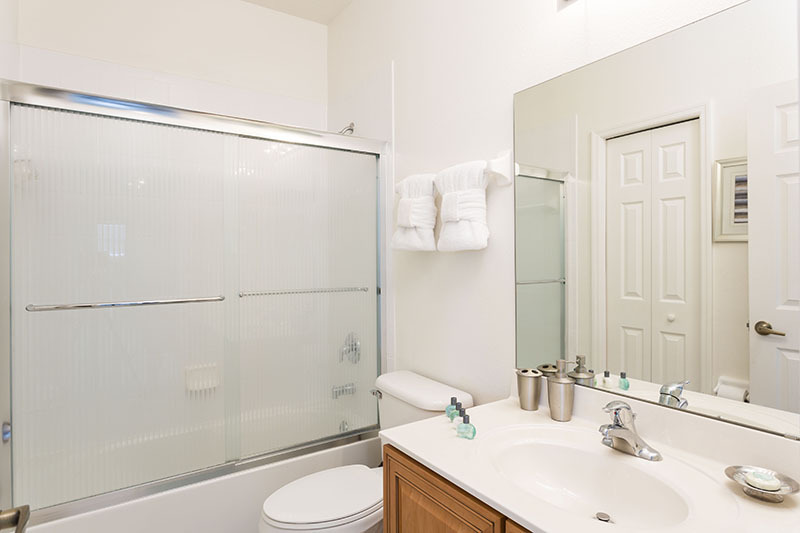 There is an outside bathroom on the pool deck for your convenience. 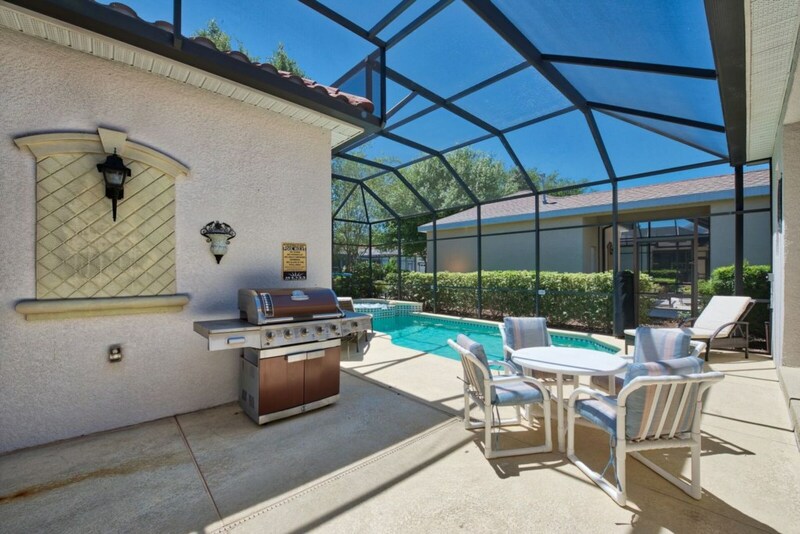 This area has a child safety fence and is covered by a pool screen keeping the bugs at bay!